Microsoft released -- better re-released -- the updates KB4458469 and KB4457136 on September 26, 2018 for Windows 10 version 1709 and Windows 10 version 1803. What makes the re-release rather problematic is that Microsoft provides virtually no explanation as to why the updates had to be re-released. This update has been re-released because of a missing solution. If you installed build 16299.697, please install this newer version of OS build 16299.699. This update has been re-released because of a missing solution. If you installed build 17134.319, please install this newer version of OS build 17134.320. The company does not provide any detail on what the missing solutions are. While it seems likely that they are identical for version 1709 and 1803, it is entirely unclear what the re-released updates add or change when installed. Administrators and users don't know therefore whether they need the updates. It could be an important component that is missing, or something that does not affect lots of configurations. 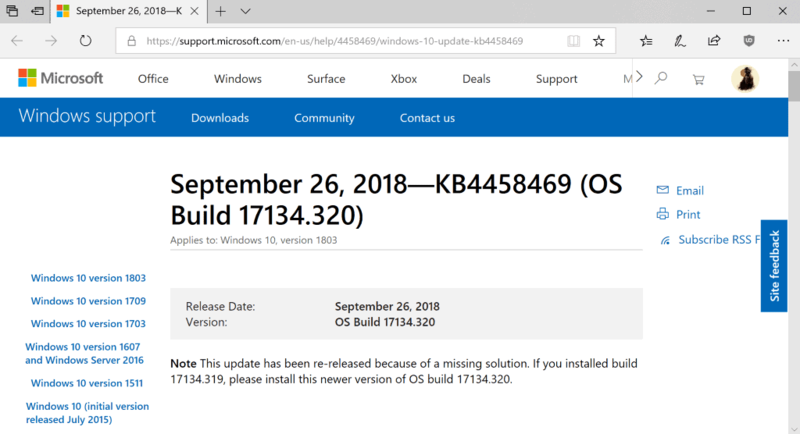 The updates KB4458469 and KB4457136 were released on September 21, 2018 initially. Microsoft released KB4457141 and KB4457127 on the same day; a quick check revealed that these two updates were not re-released by Microsoft. Notes were not added and the release date is still September 20, 2018. Whether the two updates will be re-released as well in the coming days or if these two updates were not affected by the "missing solution" is unknown. I talked about Microsoft's inability to communicate clearly with its customer base. Especially home users and small businesses are often left in the dark when it comes to the release of updates for Windows and other changes. One fairly common occurrence in this regard is that some Support pages get published after the release of updates. Users and administrators don't know what updates do when they can't access support pages that provide details. It gets worse for non-English admins and users as Microsoft sometimes updates the English Support articles only. That's why I recommend to always read the English support article and not the non-English one that may also be available. As far as the mysterious "missing solution" is concerned: my bet is on a file or files that Microsoft forgot to include in the update. Whether that is really the case remains to be seen. Now You: What is your take on the "missing solution"? Totally blank and list no previous updates at all. Is Microsoft simply embarrassed of recent updates or just really bad at understanding how bad this makes them look? Idiots at Microsoft do it again. Sat at the spinner after reboot for 15+ minutes… Gathered my courage and decided to hit the reset button finally! Seems good now, knock on wood… Having a full system backup was also calming in this situation! Agree, having a backup in place is comforting, especially in situations like the one mentioned. I always clone *my entire system drive* before applying Microsoft updates, because Microsoft updates are like Forrest Gump’s box of chocolates: you never know what you’re going to get. Failed install on automatic, but succeeded on manual standalone install. Thanks Martin for the infos. Seams just one thing added: •Addresses an issue that prevents dual tunnel AlwaysOn VPN configurations that use trusted network detection from having both tunnels operational. Don’t be a part of Microsoft’s free beta test team unless you love the pain that failure brings. Delay updates and ALWAYS have a recent backup on hand when they do install. Ah God, years passing, but win10 not changing at all, such a stable bummer. I am on Windows 10 Pro Version 1803 (build 17134.285) and didn’t get this 4 updates. I’m still wondering about all the ‘other’ little updates. Apps! Every single app wants to go online by itself. (at least every one of them wants its own rule in the firewall) None of them seem to be part of the WU system. What are all these little apps up to and why do they need to connect to the internet? I may have been one of the first guinea pigs for the KB4464218,KB4100347 patch updates last week. Upon reboot the system seemed to go into a hang condition and forced me to abort the startup and the Microsoft update entered and fetched diagnostic variables. I sent them a note feed back on sending out beta software to the public and my thoughts on needing to move to linux on the desktop. The next day I was forced by the win10 to apply a new KB4464218 patch which has solved the problem with the update………..
I’m in Australia and my build for Windows 10 64-bit 1803 is 17134.285. Just manually checked for updates and 2 appeared for KB4458469 and KB4100347, not those mentioned in this article. I know new build releases are staggered, but I thought updates were rolled out on Patch Tuesdays everywhere (?). “The note includes the same wording for Windows 10 version 1809.” <— Did you mean "1803"? Or have you got 1809 early? I am network and system administrator , My network pc updated automatically this win update september 26 2018—kb4458469 after that my user cannot shown there active directory shear folder . Any body can help me to solve this issue. Windows 10 KB4100347 contains a new Intel microcode library to address Spectre vulnerabilities. On a Broadwell E processor (CPUID 406F1) this library loads microcode revision 0xB00002C at boot. However, Intel has only released microcode revision 0xB00002E as per Microcode Update Guidance dated July and Aug 2018! It is widely known by now that KB4100347 breaks the overclocking capabilities with most X99 motherboard / Broadwell E combos. While incorporating the new microcode into the BIOS may be a remedy on some systems this is out of reach for most users.